What fisherman hasn't said "Just one more cast and I'll head in…" ? 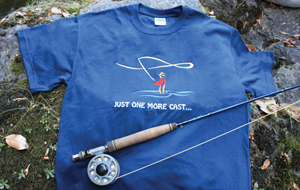 The striking image of a fly fisherman standing mid-stream and casting is beautifully embroidered on this blue dusk colored shirt with the phrase "Just one more cast…" below. The multi-colored embroidery on this shirt is the nicest I've ever seen! This quality tee is heavy-weight, preshrunk 100% cotton and is built to last!